While world leaders were gathered in Paris to reduce greenhouse gas emissions, everyday life came to a standstill in Beijing this week as thick smog blanketed China’s capital. Air pollution had reached such an unhealthy level that the city government issued its first-ever red alert, closing schools, clearing cars off the road, and powering down factories. For over a decade, Pacific Environment has been partnering with grassroots leaders across the country to help reign in the country’s horrendous air and water pollution that is sickening communities and poisoning rivers. 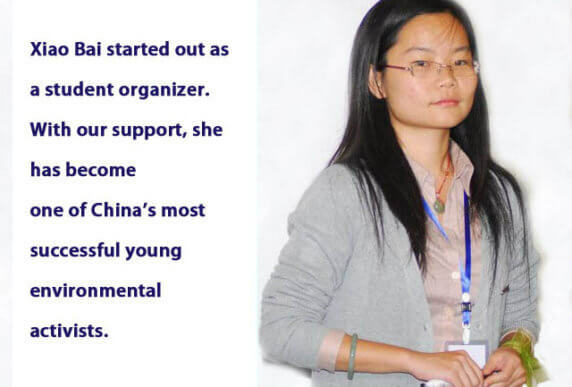 One such courageous grassroots leader is Li Chunhua, better known as “Xiao Bai” or “Little White.”Her group, Green Stone in Nanjing, started out 10 years ago with seed funding from Pacific Environment to clean up pollution, promote transparency, and hold polluters and government officials accountable. Green Stone published an online map of polluters. Soon, Xiao Bai says, “We started getting calls from factory managers who wanted to know what they had to do to get off the map.” And so Green Stone started advising big companies on their environmental practices. This year alone, Green Stone’s impressive results include six polluting factories closed down, 30 more fined and issued orders to clean up by local authorities, and a criminal investigation launched against a company owner. Xiao Bai and her organization have effectively changed the way companies do business in the city of Nanjing. And along the way they pioneered a public participation model that helps communities clean up severe air and water pollution through cooperation with local business leaders and government authorities. Pacific Environment and our partners in China are committed to continuing our grassroots efforts to help solve the country’s air and water pollution crises.